“Thoracic” refers to the thorax or in layman’s jargon, the chest. The chest cavity contains the heart, lungs, oesophagus, chest wall and diaphragm. The organs inside the chest are protected by the rib cage. Thoracic Surgery is the science which deals with surgical diseases of the chest. A thoracic surgeon provides operative, perioperative, and surgical critical care of patients with a large number of acquired and congenital pathologic conditions within the chest. Traditional open surgery: This is a technique where the chest is opened by an incision. While there has been a tendency to denigrate open thoracic surgery calling it “back dated” the truth is very different. In many complex cases, traditional open surgery provides surgeons better access to the area to be treated. Sometimes a patient’s age, physical condition and surgical history may necessitate open surgery. In recent times, it has been possible, in many cases to use state-of-the-art robotic-assisted technology or endoscopic techniques,to perform complex and delicate procedures through small incisions with unmatched precision. Non-robotic minimally invasive surgery (endoscopic): Non-robotic minimally invasive surgery is also known as endoscopic surgery. You also may be familiar with terms like VATS,thoracoscopic surgery, or “keyhole” surgery. These are minimally invasive procedures that utilize an endoscope to reach internal organs through very small incisions.During endoscopic surgery the surgeon inserts a thin, flexible tube with a video camera through a small incision or a natural orifice like the mouth or nostrils. The tube has a channel to utilize tiny surgical instruments, which the surgeon uses while viewing the organs on a computer monitor.This technique allows the surgeon to see inside the patient’s body and operate through a much smaller incision than would otherwise be required of traditional open surgery. While minimally invasive surgery effectively reduces time and gives surgeons greater control, and benefits in many ways, contrary to projections in the media and propaganda, it is not suitable for everyone and cannot achieve equivalent results (as compared to open surgery) in many cases. It is also definitely more expensive than open surgery. The correct approach is therefore to choose the surgical technique which is appropriate and meets the patient’s needs and can resolve the clinical problem. Dr S Bal is adept and competent in open surgery and also in all forms of minimal access surgery, be it VATS or Robotic assisted surgery. 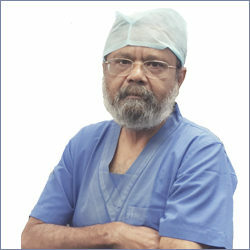 More importantly, he is committed to providing innovative and safe alternatives where traditional open surgery can be avoided or is not required.This ensures that he offers the right surgical treatment approach to every patient, depending on his disease, without any other extraneous consideration.